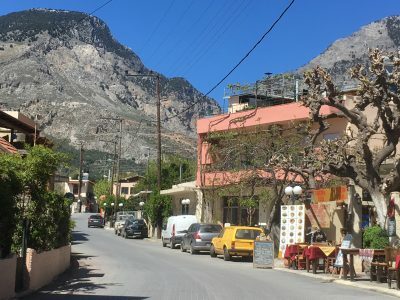 If you think a family holiday to Crete is all about the beach, think again. 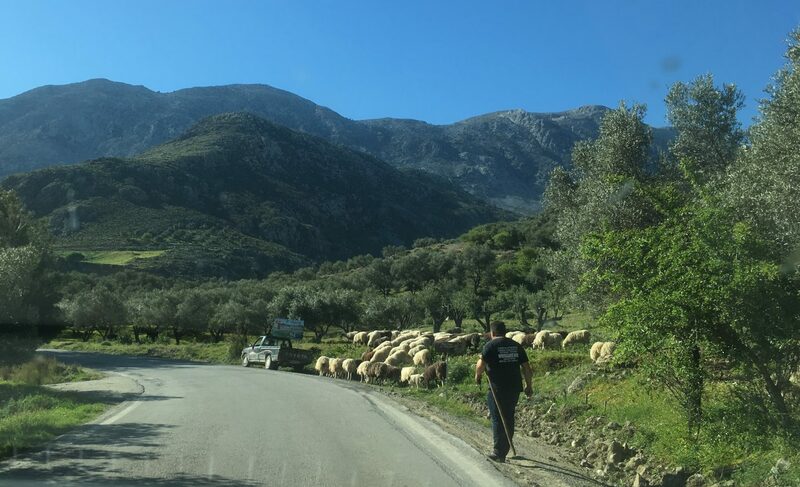 Heading inland, particularly in spring, you’ll discover peaceful villages, incredible hospitality and stunning scenery. 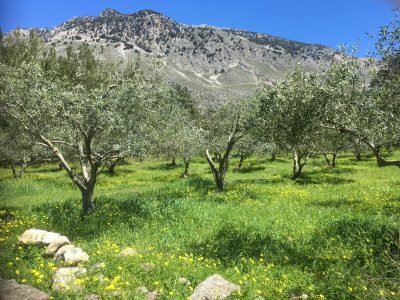 But will your children appreciate or indeed enjoy this authentic experience of Crete? Ours (aged six and four at the time) thankfully did and this was in no small part down to where we chose to stay. 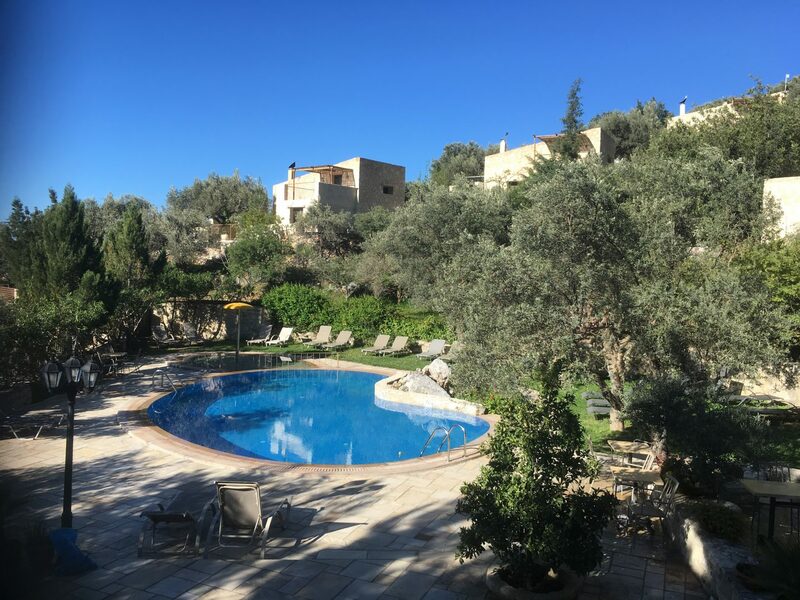 As family-friendly properties go, it’s hard to fault Eleonas Country Village: wonderful staff, luxurious accommodation, great food… and a playroom next to the cafe. I’m not sure who enjoyed Eleonas more in our family, the parents or the children. 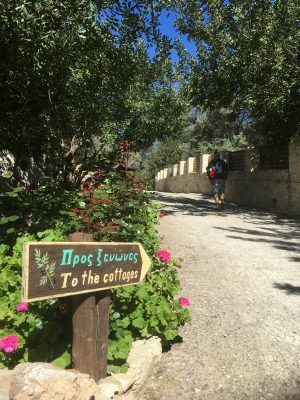 Our stay at Eleonas was the first stop during our road trip around Crete in 2018. Despite setting off from our home in the UK at 4am, we felt relaxed the moment we stepped through the gates of Eleonas. 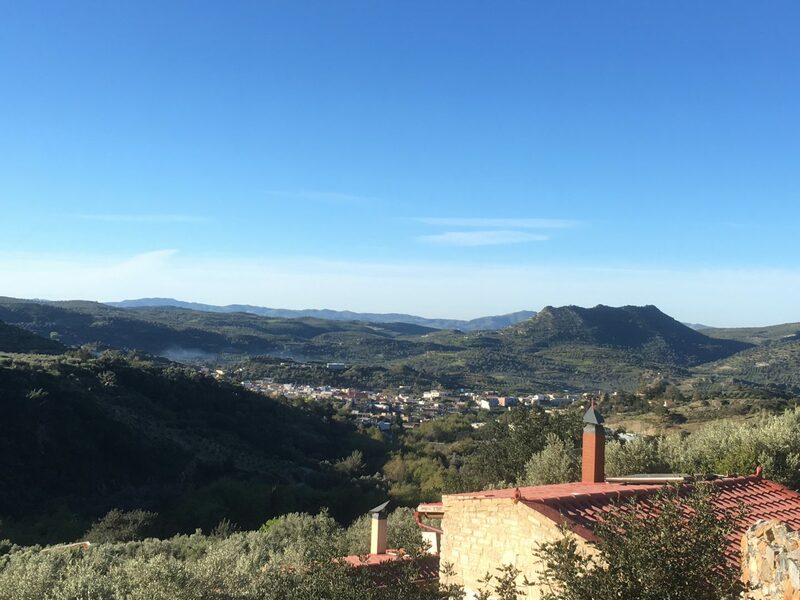 We visited in April when the weather was pleasantly warm, ideal for lazy days in the heated swimming pool and forays into the surrounding countryside. 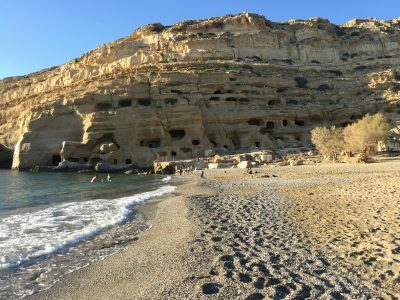 Eleonas Country Village is located about 50 kilometres inland from Heraklion and the popular beach resorts of the north coast. 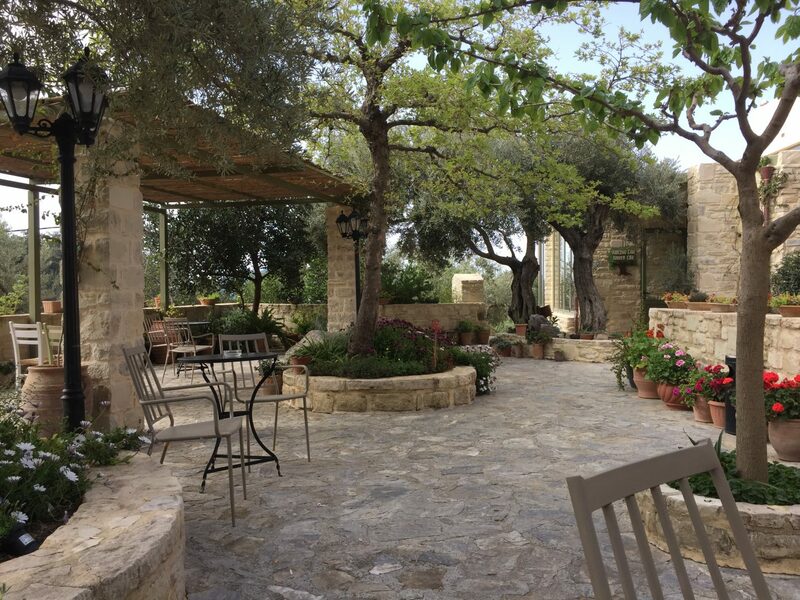 The hotel is reached via zigzagging country roads with views, in spring, of flower-filled olive groves. 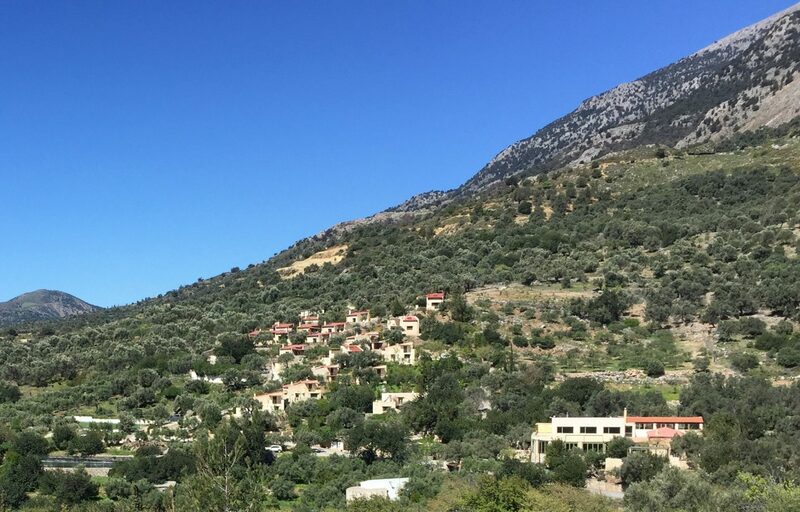 The property consists of 20 stone cottages which are scattered over a hillside amid the foothills of Mt Psiloritis, Crete’s highest peak. 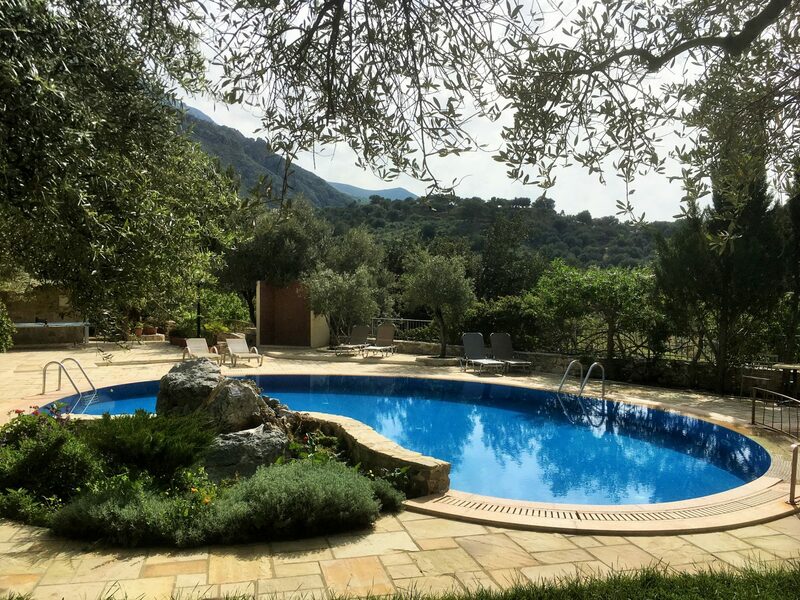 Facilities include a heated swimming pool (plus paddling pool for little ones), a small outdoor gym area, bikes for hire, cookery classes and spa treatments. Everywhere there are birds singing and bees buzzing, attracted by the flowerbeds brimming with fragrant herbs. Eleonas has an indoor soft play room plus an outdoor play area which is overlooked by the cafe’s courtyard. Sipping morning coffee in the sunshine while our children played nearby, it was very tricky to muster the energy to get up and go anywhere, such was the tranquillity of the place. 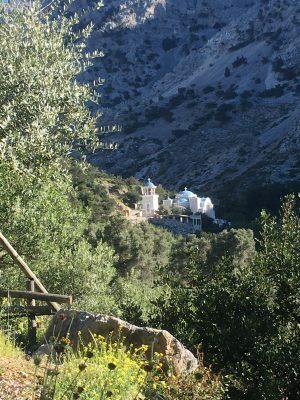 We are new to hotel stays with children (we usually self cater) so the buffet breakfasts of freshly cooked local Cretan dishes, homemade yogurts and jams were a real treat. Evening meals were delicious: meats and vegetables baked in a traditional wood oven, tasty salads and daily specials all washed down with excellent local wine. 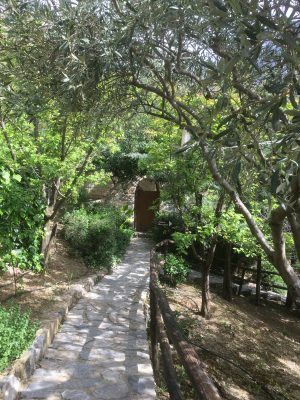 Our boys wolfed down their dinner each day and then dashed off with other children to the play area allowing us adults time to savour the complimentary dessert and raki which seems to accompany every meal everywhere in Crete. The staff in the restaurant were incredibly kind and friendly. 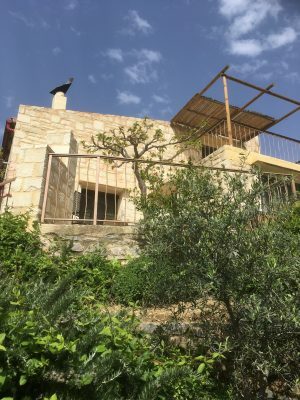 The luxurious stone cottages can sleep from two to six guests. We had a two bedroom mezzanine cottage which was very spacious. Both sleeping areas (the mezzanine area counts as the second bedroom) have access to a terrace where we had incredible views over the countryside below. There is a simple kitchenette with small stove and fridge plus a living area with a sofa bed and fireplace. It wasn’t quite chilly enough to warrant a fire but I can imagine in wintertime it would feel rather cosy. There are various walking and cycling trails directly from the hotel. Full details with a map are provided by the hotel when guests check in. 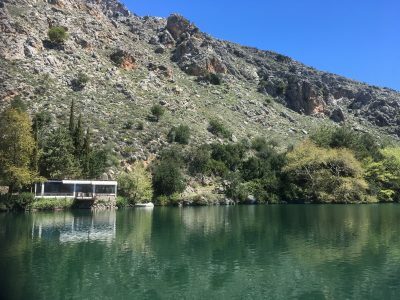 I liked the sound of Rouvas Gorge but our four year old wasn’t quite up for that so we wandered down to Lake Votomos which is used to store the local spring water which is drunk throughout Crete. From the lake, it’s a short walk into the little country town of Zaros where life moves rather slowly. 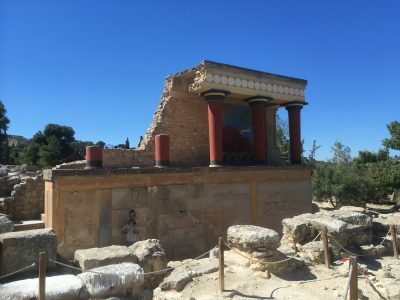 Further afield, it’s possible to access Knossos, the ancient Minoan capital plus a host of beaches, the closest of which is half an hour’s drive. 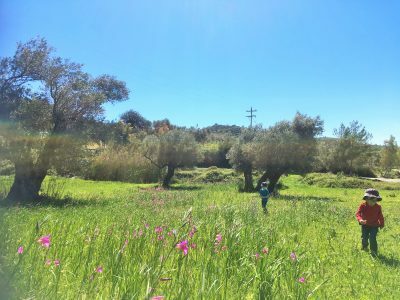 Although driving this distance to the beach with young children might not immediately appeal to parents, it gave our little one the chance for a nap and we loved exploring the countryside. Getting the balance right at a family friendly hotel is very tricky. Manolis, owner and manager of Eleonas, and father to young children himself, has clearly thought long and hard about what makes a hotel enjoyable for families. 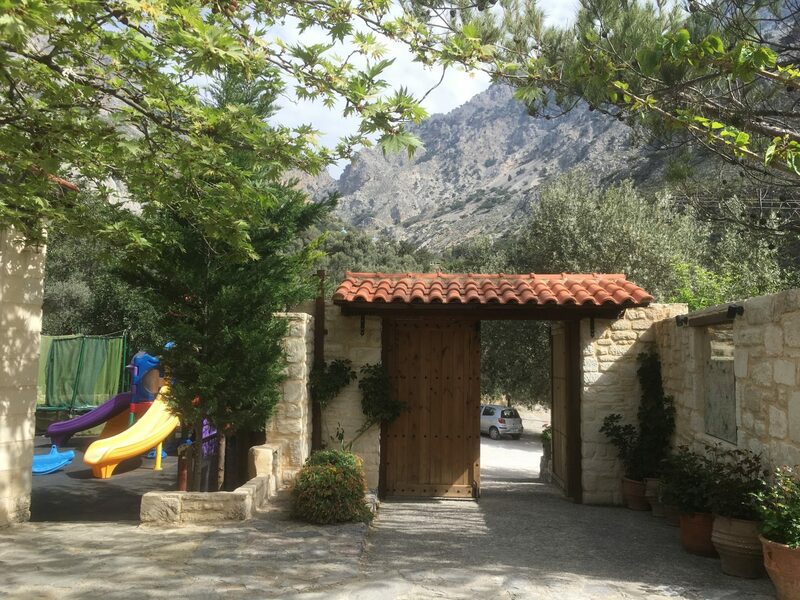 Eleonas is a place where parents can really relax and enjoy time together while their children are free to explore and make friends independently. 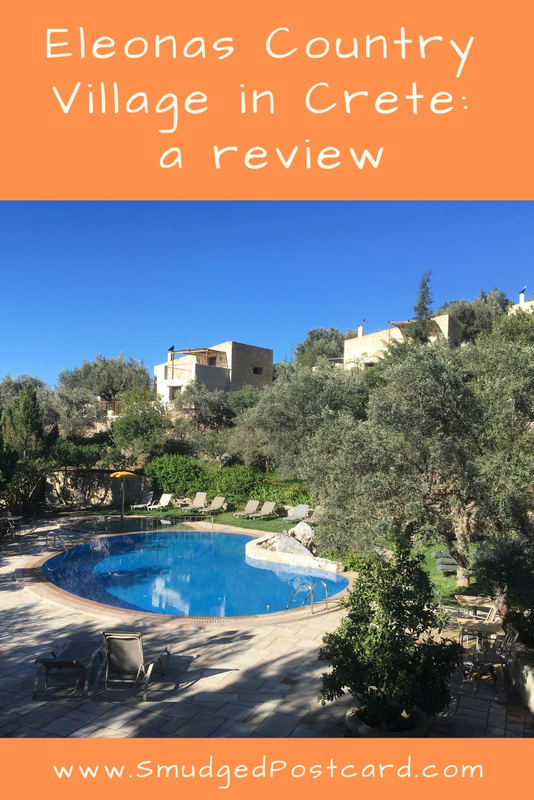 During our Cretan adventure, we combined our stay at Eleonas with a few nights at Milia Mountain Retreat in the White Mountains and the Ammos Hotel near Chania, this made for a really diverse and fun holiday. 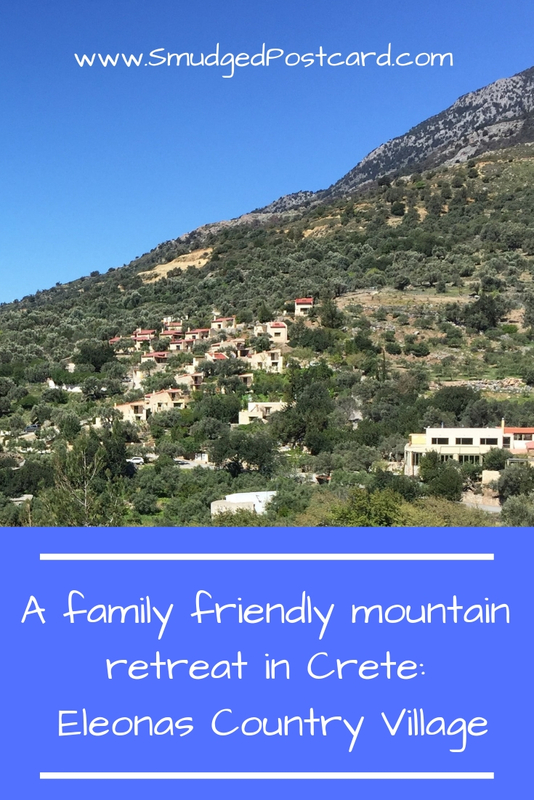 Have you had a family holiday to Crete? Let me know in the comments below. 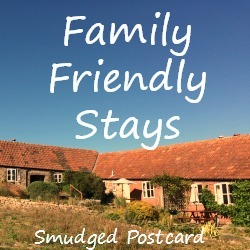 This post is linking to February’s edition of Family Friendly Stays, the travel blog link up for reviews of interesting family-friendly places to stay. The link up goes live on the first Wednesday of each month. The owner lives on site with his young family, he’s put a lot of thought into it! It felt utterly perfect when we stepped through those gates! It really is lovely there, we really want to go back! This place looks absolutely wonderful. I love the stone cottages, and I love the fact that there is a heated swimming pool and a gym area ( my hubby always has to go the gym!!) and the bikes for hire, cookery classes and spa treatments are a nice touch too. Thanks for linking up to Monday Escapes. Places like this are gold dust for families, I wish there were more! It looks beautiful, the view from your terrace is to die for! Yes, we definitely need more places like this, it totally ticked all the boxes, so relaxing!